Anyone is a skilled operator at once. Excellent A.I. (artificial intelligence) placed in the cloud connected over Internet. It is SCISSOR HANDS. This AI system developed in United States instantly creates the best cutting procedure according to CIP4/JDF data. It is an eRC Series cutting machine that can access its splendid performance. ITOTEC, being an advanced engineer, brings innovation of efficiency improvement to the cutting work in Japan. Easy-to-understand animation makes you feel as if you are handling paper on a leveling block. 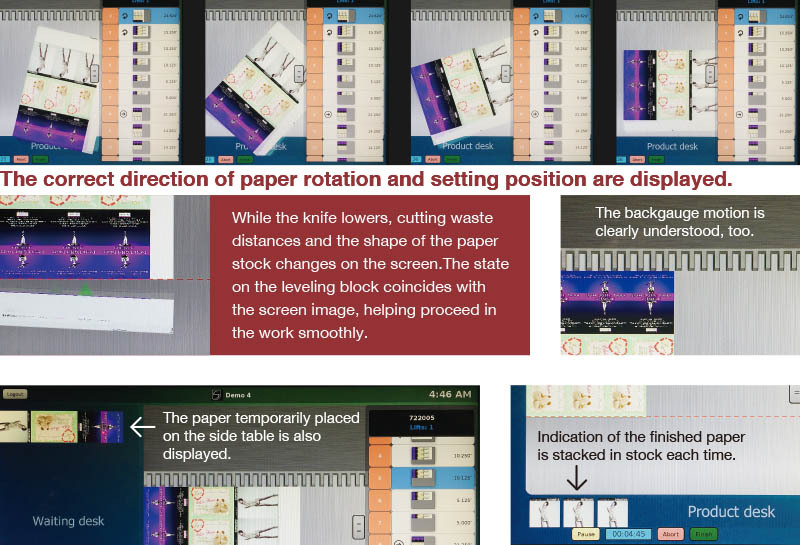 The most efficient cutting procedure is displayed on the touch screen panel and motions such as paper rotation are displayed in advance. The operator can check the motion to be performed, feeling safe. In addition, because instructions take packaging of the item into consideration, efficiency of the work is maximized. Novices can follow indication to cut as if they are skilled workers, and the skilled can avoid errors and increase the job speed with this helpful function. The backgauge value is automatically set in the cutting machine. The operator, freed from cumbersome manual work such as entering values, is less likely to cause disorder in work rhythm. Entry errors can be avoided, too. The panel can be installed on either the left or right side of the cutting machine. Even a novice operator can work similarly to the skilled, bringing similar finish quality. The efficiency is remarkable. With support of SCISSOR HANDS, achievements similar to those of the skilled can be obtained in a short time. CIP4/JDF having been rarely used in the post-press field is thoroughly utilized to make cutting work efficient. 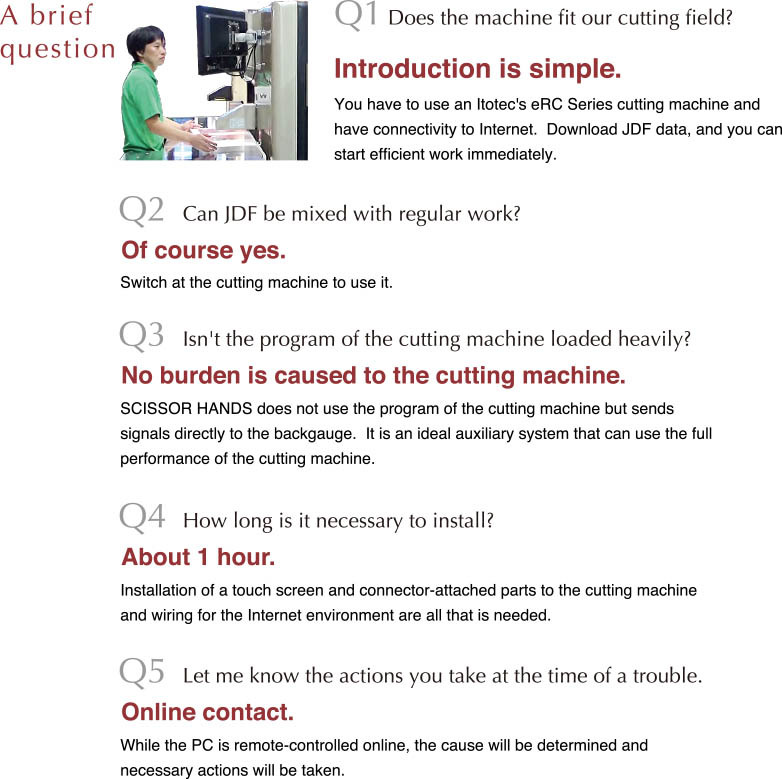 The operation situation of the cutting machine can be linked with in-house control systems such as MIS, helping comprehend the progress, cost comparison and examination with the actual achievement and so on. Internet connection environment and wiring with connection devices are necessary to use SCISSOR HANDS. Contract will be made into with Itotec for the first year. In the next year and thereafter, direct contract will be made into with OPEN SOFT. Our charge does not include expenses necessary for the cutting machine itself. The indicated amount does not include the consumption tax.